Last week we brought you Graylog2 which takes the otherwise boring job of log monitoring and provides some pretty slick searching, filtering, and visualization. 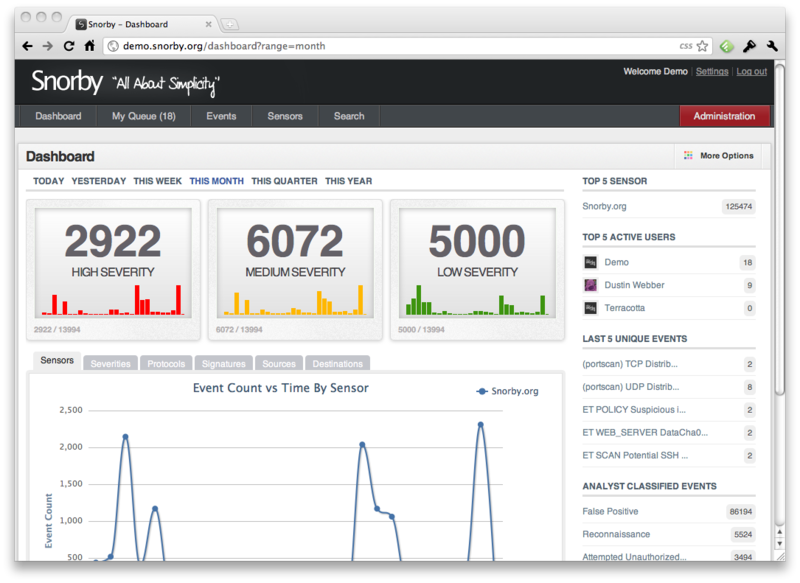 Dustin Webber aims to do the same for network security monitoring with Snorby, a Rails application front-end for Snort, Suricata, and Sagan. Metrics & Reports - Drill down into your data by day, week, month, or custom timetables and even export to PDF. Snorby comes in two flavors, the Insta-Snorby NSM network appliance which bundles Snorby 2.2.4, Snort, Barnyard, OpenFPC, and Pulled Pork, or as application source to roll your own solution. Check the Snorby web site for instructions on installing from source. Be sure to follow Dustin on Twitter, join the mailing list, or drop into #snorby on irc.freenode.net for updates or ask questions.